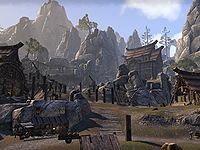 Dragonstar is a town in northwestern Craglorn. The townspeople are currently busy mining nirncrux for Regent Cassipia. The Dragonstar Arena can be found nearby. The town is patrolled by Dragonstar Guards. Horses, goats and skavengers can be found in the surrounding farms, and gravelclaws can be seen outside the mines. Holding Court: Assist Regent Cassipia at Dragonstar. The Truer Fangs: Assassinate three Satakal worshippers who converted to the Scaled Court. Caravan Company Depot — The inn located in the town of Dragonstar. The Cracked Anvil — The smithy located in the town of Dragonstar. 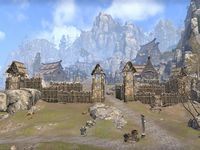 Gateside Market — The marketplace located in the town of Dragonstar. 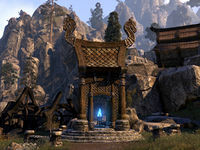 The Dragonstar Wayshrine is located outside the city walls, to the south. Dragonstar previously appeared in Shadowkey like many locations in Craglorn, and first appeared in Arena. This page was last modified on 9 February 2019, at 07:15.